After the episode of dense fog in the Central Valley that I mentioned in my last post, the fog lifted into what meteorologists call a stratus deck last week – essentially a layer of fog that’s slightly above ground level. From the Central Valley the stratus deck would look like a low overcast. If you were to drive out of the valley into the Sierra, you’d climb into the clouds, and into a layer of fog, and then eventually get above the fog and into sunshine. And if you could find a hill or ridge that rose above the stratus deck, you’d be able to look out over a sea of fog. That sight should be familiar to people who live in the San Francisco Bay Area, or anywhere along the California Coast. 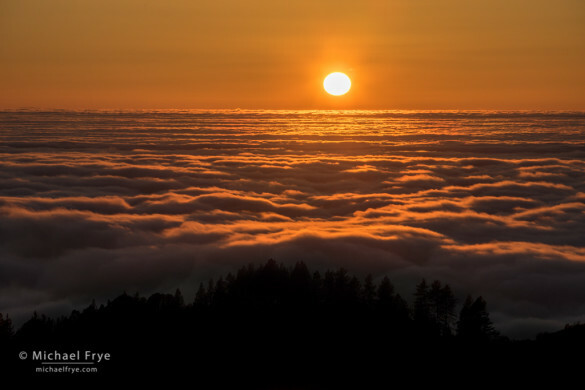 When I lived in the Bay Area in the early ’80s, I remember driving along Skyline Drive on the Peninsula and looking out to the west over a sea of fog covering the ocean. At that time my interest in photography was in its infancy, but it was a beautiful sight. 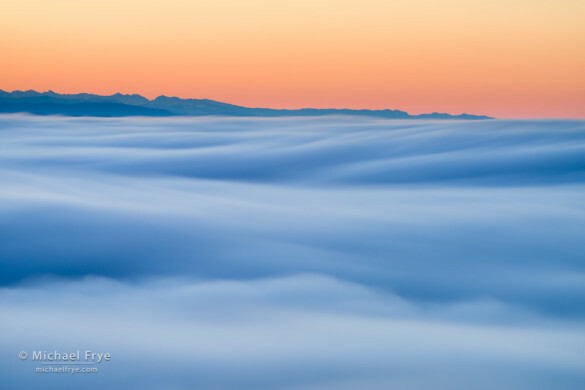 I’ve had that mental image in my mind ever since, and have long wanted to make photographs from above a sea of fog. Since then I’ve seen some wonderful images of the Golden Gate Bridge poking up through fog, and other photographs with a similar theme from the Bay Area, and other spots. Last summer I got a chance to look down on fog at the mouth of the Klamath River, and made a couple of photographs that I really liked, but that wasn’t really the sea of fog that I remember seeing long ago in the Bay Area. So that stratus deck last week piqued my interest. It seemed possible to climb a hill and get above the fog somewhere, but it would require being in the right spot at the right time. The fog moved in and out, and up and down, in unpredictable ways. Searching for the right situation, on Tuesday afternoon I drove up a local mountain with radio towers that every Sierra foothill town seems to have. By Sierra standards this mountain isn’t very big, but it’s summit reaches up over 4,200 feet, which is 2,000 feet above the surrounding valleys. That evening I noticed a spot along the road with a good view to the southeast, so I decided to try again the next morning, hoping that the fog would spread further in that direction. And luckily it did. There was fog at my house that night, at 2,700 feet, which was a good sign, and when I got above the fog I could see a vast ocean of fog all around the mountain. 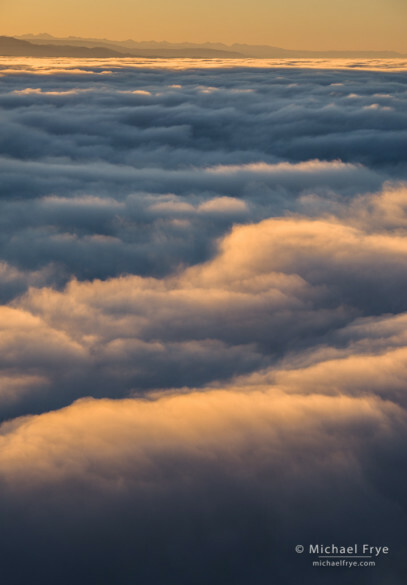 The view to the southeast was spectacular, with the dawn coloring the sky above the distant high peaks of the southern Sierra, and oceans of fog below. Probably my favorite photograph from that morning is the one at the top of this post. I used a 30-second exposure to blur the motion of the clouds, creating the pillowy texture in the fog. Then the sun cleared the peaks, and raked across the top of the clouds, creating some wonderful textures. I’ve included some more images from that morning below. That was a beautiful sunrise, and I didn’t think that could be topped, but the next morning might have been even better. I’ll save those images for my next post. Love the first photo because of the layer of colors and movement of the fog. Epheral and dreamy. It is like when you flying just over the cloud layer in an airplane at sunrise/sunset. I love fog too! Thanks for sharing! Michael, beautiful photos. I like them all, but I am especially drawn to the setting sun image. 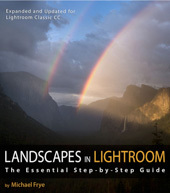 Did you use a neutral density filter to achieve the long exposure? If so, how many stops on the filter? Thank you. Thank you Hadley! Yes, I used a neutral-density filter to get the 30-second exposure for the first image. I think it was the four-stop, but it could have been my seven-stop filter. My favorite is “Ponderosa pines in the fog on Mt Bullion”. The presence of those few trees seems to tether the scene to the earth as the fog slowly envelops (or perhaps retreats) from the mountain. 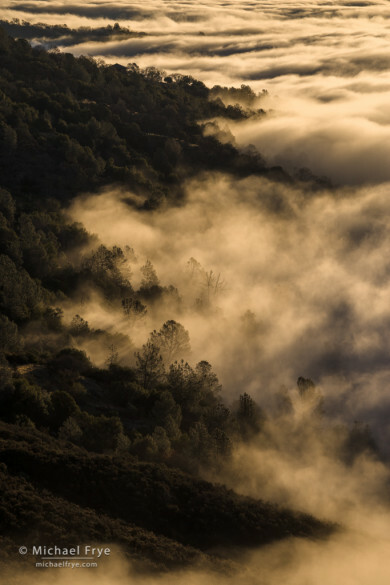 Sigh, I miss the Bay Area, even though I never did photograph this kind of fog from up high. But I have vivid memories of taking off from SFO and seeing the fog creeping underneath the Golden Gate Bridge. Another lovely series. 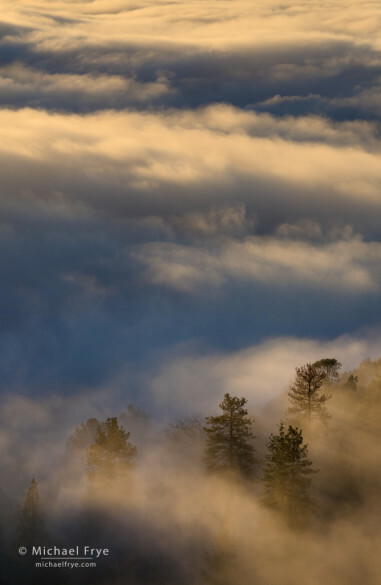 I think my favorite is “Ponderosa pine in fog on Mt. Bullion.” Lots of wonderful things going on in it. The Bay Area is certainly a good place for fog. Mark Twain didn’t appreciate it, but photographers can. 🙂 Thanks again! Beautiful set! For me, every image in this post keeps getting better than the last. Those final two with the sea of fog lapping at the trees are out of this world (though maybe I’m just saying that because fog and trees are both in short supply and a bit exotic out here in the Great Basin!). Thanks Jackson! I’m sure you get fog once in awhile in the valleys after some rain or snow. Might be quite photogenic. Oh, it is! Still pretty exotic, though. Cool – that first image is especially nice. 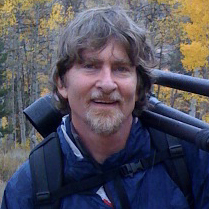 Do you have aspens out that way? Up high in the Whites there are some very good stands, but certainly none down here in Deep Springs Valley. I did discover a few hidden pockets of potential fall color this year, though. Hmm, yes, I bet there are some good stands in the White Mountains. I might have to check them out one of these years. Yet another fog lover, me… 🙂 Keep them coming, thanks. I love the sweet fog filtered soft light on the trees and they look like they are floating in the clouds/fog. I love fog so much my girlfriend who is also a photographer thinks I am nuts. She grew up in SF so she is less enamored with fog. Its why I drive up to the Northern CA coast redwoods every year. Big Sur coast, Pt.Lobos, Pt. Reyes, etc. are great spots for fog images. I am a member of the fog-loving photographers club, too.